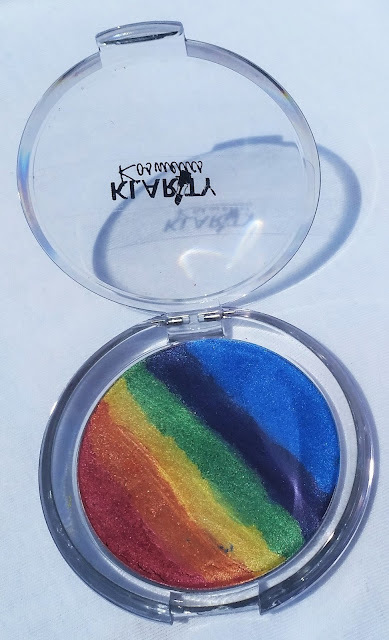 The Kolour Explosion Rainbow Highlight is a rainbow colored highlighter from Klarity Kosmetics, a black-owned, indie brand. For swatches and the full review, then read this article. I'm excited for this week's post as the product I'll be reviewing and swatching is from an indie brand. 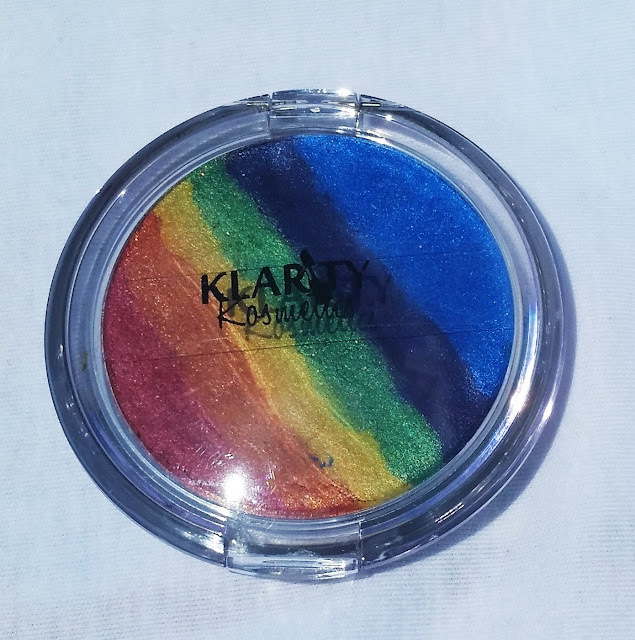 The product I have is the Kolour Explosion Rainbow Highlighter by Klarity Kosmetics, where it's made by hand. Lately, you guys have probably been hearing and seeing all the buzz surrounding the Rainbow Highlighter by Bitter Lace Beauty, which is also an indie brand. It has been reviewed by some of the top bloggers and Youtubers in the beauty community and has been in high demand since. 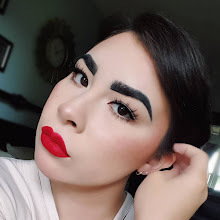 I know some don't like this kind of product because they find it unpractical or they don't think they can wear something like that, but this product is definitely up my alley as to what I like in makeup. I might be a little late to the rainbow highlighter party, but I wanted to show you guys a dupe/alternative for those that want to buy one, but are having difficulty getting it. I originally wasn't seeking to acquire the rainbow highlighter or anything similar, I just happened to see the swatches of the Kolour Explosion when it rolled across my Instagram feed and was sold on getting it. My initial impression of this is that the pan is pretty big (59 millimeters about 2.3 inches) and you're definitely getting more bang for your buck because this is 7 grams of product versus the original which is 6 grams. The Kolour Explosion also comes glued in a compact, which I'm glad for because I dropped it right after I opened the package and it's still in one piece. The Kolour Explosion costs $18.00 USD and costs around $23.00 USD when you include shipping, which is $4.00 USD cheaper than the one by Bitter Lace Beauty. Being that Klarity and Bitter Lace Beauty are both indie brands, they're going to be pricier than if they were made by a corporation. Now, the main difference between this highlighter and the other is it uses darker, more vivid colors and not pastels, which I actually prefer the bolder colors. I did a dry and wet swatch of this product. I had first swatched them dry by taking my finger into the product and tried swiping across. I did have some difficulty because the pigment would come off real easy out of the compact, but it just didn't want to come off my fingers when I swatched and ended up using a patting motion instead. For a highlighter, they do pack a lot of pigment in dry form with a decent amount of shimmer. The orange, blue, and purple did require some layering to get the same level of pigment as the others that I got in a couple swipes. Blue and purple also don't seem to pack as much shimmer as the rest of the colors in the compact, which when I looked at the comments about the other rainbow highlighter, quite a few people actually preferred it without those two colors because they make it look like you have a bruise on your face. Luckily, when you buy it, you can actually request certain colors not be added or be added in small amounts. With the wet swatch (picture below), I used a damp brush and did a swipe motion and patted it on if needed, which I needed very little product to swatch. The water ended up sheering out the color, but you're getting about the same level of shimmer as the dry swatch, except for the blue and purple. When you apply this wet, you don't want to load up on your product because the colors will go on pretty dark and it'll look like you painted your face with water colors. Wet swatch of the Kolour Explosion Rainbow Highlighter. In terms of application, this can be applied dry or wet with a brush. I've seen people use a flat contour brush to apply the other highlighter for dry applications and it does work for this one as well, but you need to load up on more product when you do so. 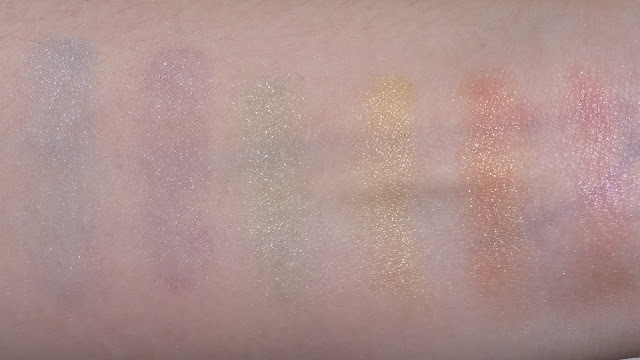 Don't let the dry swatch intimidate you, when you use a brush to swipe these on, the colors blend together, so they're not as in-your-face as when swatched separately. 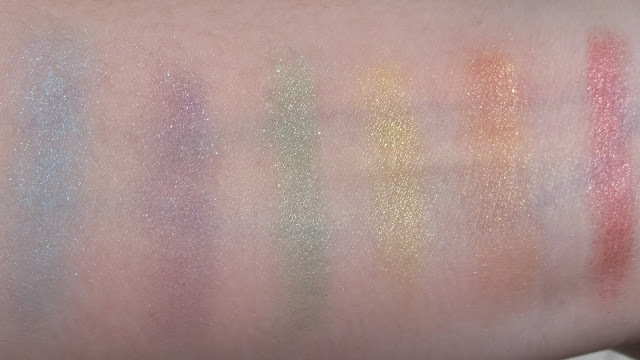 Honestly, if you want a cheaper alternative to Bitter Lace Beauty's Rainbow Highlighter, then I would consider the Kolour Explosion by Klarity Kosmetics. The only big con I see is that the pan is too big for me to grab all the colors with my brush, but it packs pigment and you're getting more product for your money. You can also ask what you want of each color when you're in the process of buying it. If you're interested in purchasing the Kolour Explosion or other products by Klarity Kosmetics, they can be purchased exclusively on their website.